There are all sorts of issues that can cause your door to malfunction, from worn springs to broken rollers to even electrical problems with the motor unit. Whatever the cause is, you can rest assured that our technicians know exactly how to handle it. We even go a step further, by offering local homeowners professional maintenance visits which help to ensure the entire mechanism is functioning optimally for a very long time. These are probably the hardest working parts of the entire system. They support and counterbalance the weight of the door itself, and make sure that the panels move in a balanced and smooth way. Because of this, garage door springs will eventually break, and the more you use the system the earlier that will happen. With proper maintenance, however, their ultimate end can be delayed quite significantly. Regular spring adjustment and lubrication is a key aspect of our maintenance service, which will help you avoid the dangerous scenario that a broken unit can create. Your automatic door has at least two different safety features to rely on. The first is a pair of photo eye sensors, which are attached to the bottom of the vertical tracks. These photo eyes will detect when an obstacle is blocking the door's path and alert the opener. The second feature is a force-resistance limit, which causes the door to reverse when it encounters resistance during its closing descent. Both of these mechanisms need to be thoroughly tested every so often to be sure of their functionality, which is why our technicians check their condition and test them during every maintenance visit. A door that makes a lot of noise while it's moving is just a few more clicks and scraps away from a breakdown. By applying lubrication to all the moving metal parts, our team can significantly reduce the noise output of the door, but also alleviate some of the friction its different parts are experiencing. This will help the entire mechanism last longer, and save you money in the long run. Whether you're in need of emergency services or you want to schedule a maintenance appointment, our team is here to help. 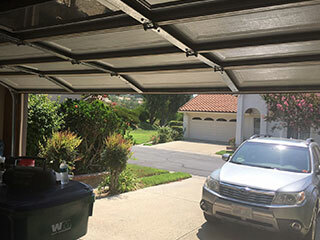 Contact our experts at Garage Door Repair Newberg today to get the best service specialists around.